Big Agnes Copper Spur Hotel HV UL2 Tent. 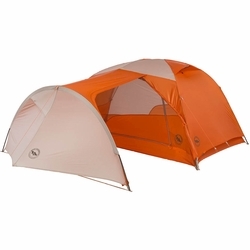 Part of the best-selling Copper Spur HV series from Big Agnes, the full-featured, ultralight Copper Hotel HV UL is designed for easy living in the backcountry with a massive vestibule attached to the fly and a high volume hub to maximize strength and increase living space without adding weight. Large dual zipper doors, steep wall architecture, and an incredibly functional large vestibule for added dry storage make backcountry trips with a smelly partner - or three - more comfortable than you may have thought possible. Copper Hotel HV UL Series from Big Agnes on Vimeo. Media pockets located above sleeping area enable clean ear bud cord routing from phones or other devices.